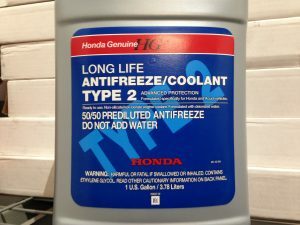 The original Genuine Honda Type 2 Coolant / Antifreeze that is in Honda and Acura vehicles has an initial 10 year service life. After that, the replacement Honda Type 2 Coolant / Antifreeze has a 5 year service life. 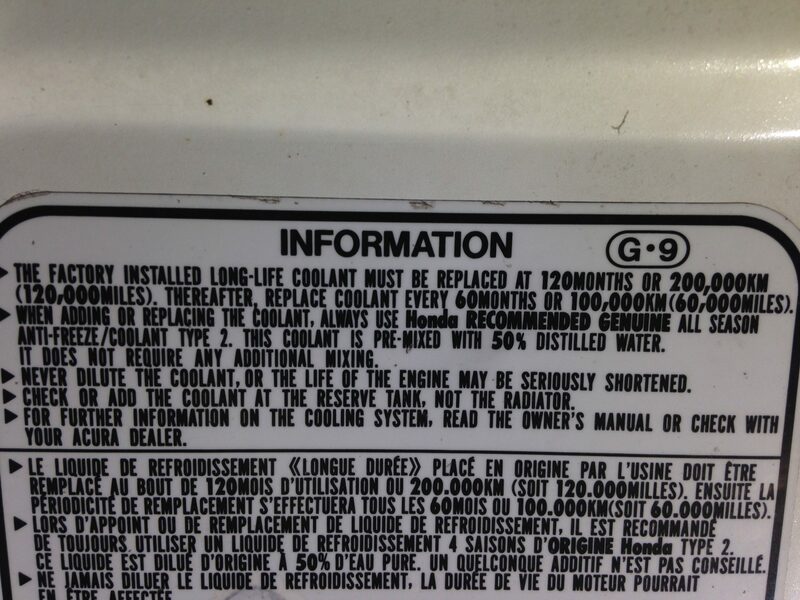 Honda Coolant Life Under hood Label. First, until 1989, American Honda Motor Company (like most car manufacturers) made many of their engine blocks of cast iron. The main reason antifreeze is used in a liquid cooled engine instead of water is because it won’t freeze below 32 degrees when the vehicle is parked. The freezing of liquid inside of anything rigid (not flexible) will result in the cracking or breaking of the container the water is in when it freezes. Engine blocks are no different. Water inside of an engine block will crack the block when it freezes – so a liquid needs to be used in an engine cooling system that won’t freeze – so the name of that liquid (which is ethylene glycol) is called “anti-freeze”. But along with the use of a cooling liquid that won’t freeze, the liquid also needs to contain rust and corrosion inhibitors that won’t corrode the engine block from the inside, out. When car manufacturers used cast iron for the engine blocks, the susceptibility of the block to rust internally was very high. The rust from an engine block could clog the radiator and heater core which would affect the flow of coolant through the engine cooling system. This would make the engine cooling system less effective, allowing the engine to operate at hotter temperatures, which could eventually damage the engine. The rust and corrosion inhibitors in the antifreeze had to stay effective and those additives have improved over the past couple of decades. Today, all Honda and Acura engine blocks are constructed of aluminum so the susceptibility of internal engine corrosion has been greatly reduced. Second, in the past, coolant manufacturers bottled engine coolant / antifreeze in a concentrated form, where water would be used to dilute the mixture. This was (for the most part) because the cooling systems of older cars had to be much larger to accommodate the larger engines and because of the metal the engines were manufactured of (cast iron). In a pre-mixed form, the amount of antifreeze / coolant needed for one older car would have cost the consumer a small fortune and the parts stores would have needed to keep a whole bunch of it in stock. The amount of dilution depended on the climate the vehicle would be operated in. In the northern states the coolant would be mixed about 30% water to 70% coolant. Here in Tennessee, a 50 / 50 mixture would be adequate for the lowest winter temperatures we could experience. 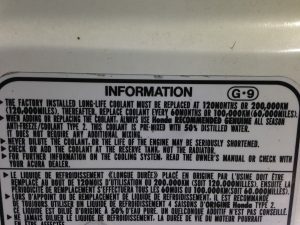 The problem was tap water was usually used for mixing antifreeze / coolant and depending on where the tap water came from, there could be minerals in that tap water that could contaminate the new antifreeze / coolant mixture. These foreign minerals in the water (such as sulphur and calcium if the tap water came out of a well) could also clog-up the cooling system. Today, most antifreeze / coolant (including the Genuine Honda Type 2 coolant) is bottled in a pre-mix form. On average, all Honda and Acura vehicles require between 1 and 1 1/2 gallons of coolant to perform a drain and fill of the cooling system. The difference between the quantities of Honda Type 2 coolant needed pertains mostly to the size of the engine in the Honda or Acura vehicle and if it has a front and rear heater core (such as a Honda Odyssey van). Today, with the metal the engine block is constructed of, the purity (PH balance) and consistency of the mixture; the Honda Type 2 antifreeze has a much longer service life; 10 years initially on the factory antifreeze / coolant and then every 5 years after that. 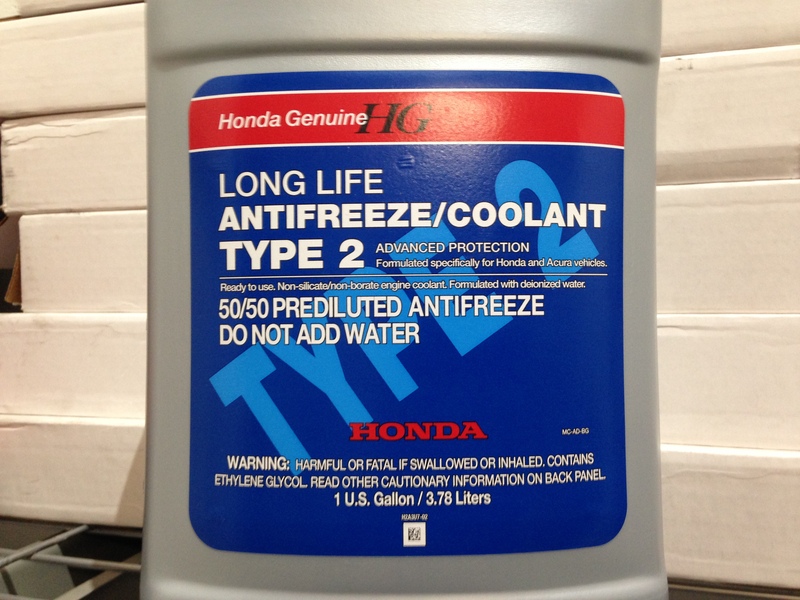 If you own a Honda or Acura vehicle, using only the Genuine Honda Type 2 coolant will save money on maintenance costs. The only reason engine coolant / antifreeze needs to ever be changed is because the corrosion inhibitors weaken after a few years. Accurate Automotive, Inc. has been specializing in the service, maintenance and repair of Honda and Acura automobiles since 1997. The majority of their service technicians started at local Honda and Acura franchised dealerships in the Nashville, TN area in the late 80’s and early 90’s. Come in and see why we are the best place in Nashville and Middle Tennessee to purchase, service, repair and maintain your Honda and Acura automobiles.